We had a quiet trip south from Thassos, motoring in little wind and just a few distant fishing boats for interest on watch in the early hours of Friday morning. 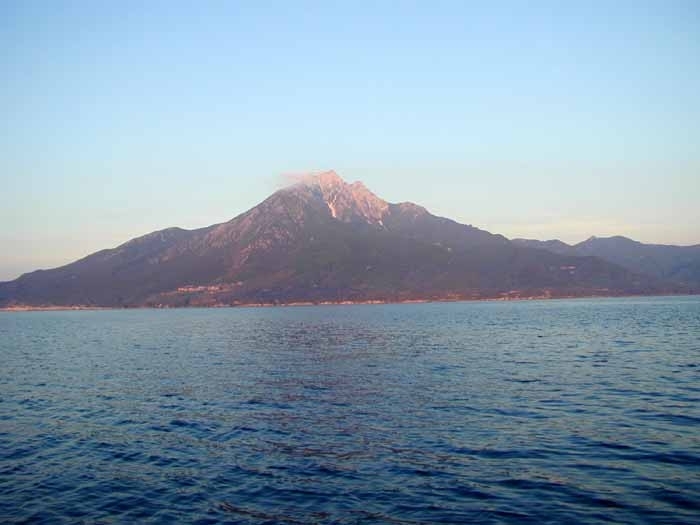 At dawn we had a short sail when the wind picked up around Mount Athos, at the tip of the Akti peninsula. We saw dolphins chasing Bonito (or some other small tuna-like fish) and there were lots of small fishing boats around so put out our line in hope (but without success). The Akti peninsula is a semi-autonomous state, run by monks of varying persuasions. Women are forbidden to go anywhere near. Some of the monasteries are very old and there are also lots of hermitages dotted around the place so its an interesting coast to explore if you are so inclined. Having rounded the end of the peninsula we then headed northwest to Dhiaporos Island off the coast of the middle finger (Sithonia) of the Khalkidikhi peninsula, arriving in the early afternoon. 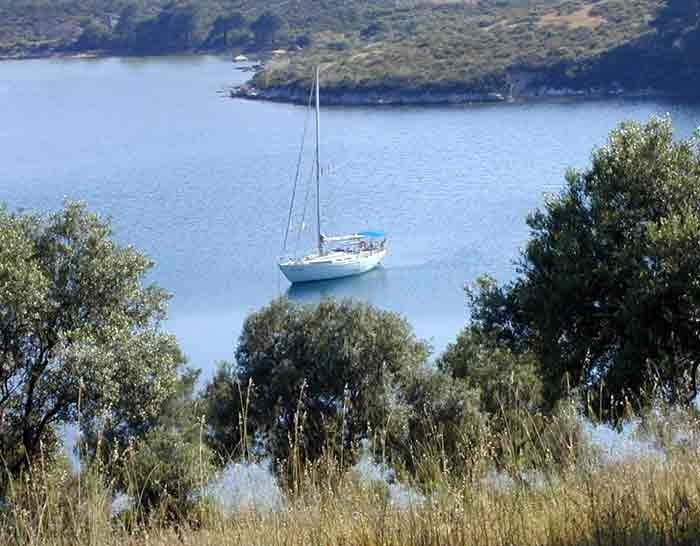 The area around Dhiaporos island has lovely beaches and a wide choice of anchorages. The beaches are all surrounded by campsites and caravans but at this time of year are still quiet and peaceful. We spent Friday night in a anchorage on the southwest of the island and then went to a nearby small harbour and village on the mainland to shop on Saturday morning. The harbour is used as a base for tripper boats taking hoards on tours to Mount Athos to see the monasteries from the sea. The local supermarket had little available by way of fresh foodstuffs but fortunately there was a small fish market with a wonderful selection of fresh fish. We bought squid and bonito to keep us going for two nights. After finishing our meagre shopping it rained for a while so we waited until it cleared before setting off for another quiet local anchorage, Ormos Kriftos. By the time we got there in the afternoon the weather had settled again and was getting warm, warm enough for our first proper swim of the season. Yesterday morning we left Dhiaporos island and headed south again. The winds have been very light so we had an uneventful motor down the coast to Ormos Sikias, a large bay towards the end of Sithonia peninsula. Once again we tried fishing, this time with squid bits as bait, with no luck. As we approached Sikias we saw another yacht leaving in the distance, the first other sailing yacht we'd seen in use since Limnos. 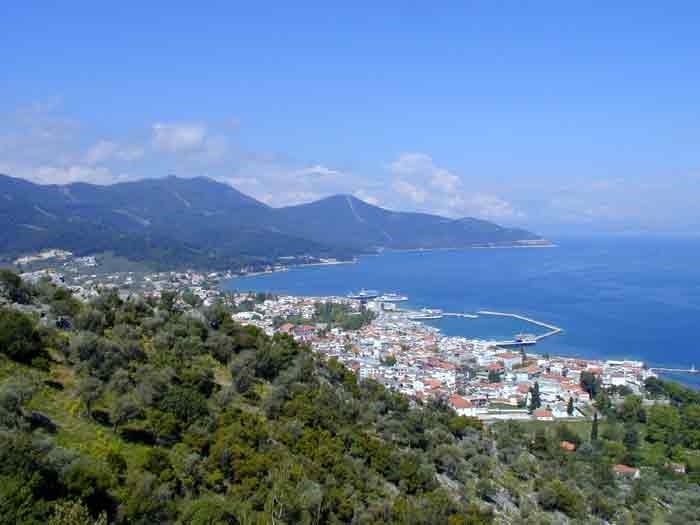 Sikias is a big bay with quite a few beaches and anchorages. We had a pleasant enough stop there but the bay gets a lot of swell, so we were glad not to have been there when the winds were stronger. The beaches looked lovely but were surrounded by campsites and caravans, suggesting the place gets overrun in high summer. Today we've come around the end of Sithonia peninsula to a large enclosed anchorage at Porto Koufo. We managed to get frozen chicken at the supermarket in the village but again found little fresh foodstuffs. In Greece these outlying communities tend to rely on fruit and veg suppliers who visit in pick up trucks at a certain time of day. The problem for cruising yachties is knowing when they are due. The one here was just leaving as we arrived and obviously didn't see us hastily getting the dinghy ready for a row ashore! We're planning to leave again in the early hours of tomorrow morning, heading south to the Northern Sporades. We're now homing in on Skiathos island, which we need to get to by Thursday evening, in time to meet Helen and Paul at the airport there on Friday.